"Good positional understanding is one of the main criteria separating masters from club players. Everyone knows how to study tactics, openings, and endgames. But, when it comes to something more sophisticated like positional understanding – majority of players simply don’t know where to start. This course will fix it!" Good positional understanding is one of the main criteria separating masters from club players. Everyone knows how to study tactics, openings, and endgames. But, when it comes to something more sophisticated like positional understanding – majority of players simply don’t know where to start. There isn’t much material available on positional chess for beginners and club players. There are books and videos suitable just for the advanced players. But there is next to nothing for beginners covering positional chess as if this topic isn’t important! A sports car with deflated tires won’t run very fast. Changing oil and gas grade won’t do the trick. What you need is to simply inflate the tires. This is the simplest and yet most effective solution! Same happens to a chess player with a lack of positional understanding. His tactics and endgame skills may be there, but if he doesn’t know WHAT to do in the position he will soon be lost. Trust me, if you simply learn the fundamentals of positional chess early on, your progress will skyrocket. And we are here to help you with that! We understand that you don’t have months to study positional nuances and wait for more months before you can apply the knowledge to see the results. This course is not magic; it is a highly structured training covering 15 most important positional elements that every chess player must know. You won’t wake up a positional expert overnight, but thanks to IM Castellanos’ decade of experience, you will get an unparalleled edge against your competition. By digesting the ideas presented in the course, and going through the practical section you will learn everything a strong player needs to know while saving tons of time. You will also avoid many common mistakes that club players make when it comes to positional chess. Instant download of 8.5+ hour positional course for club players. 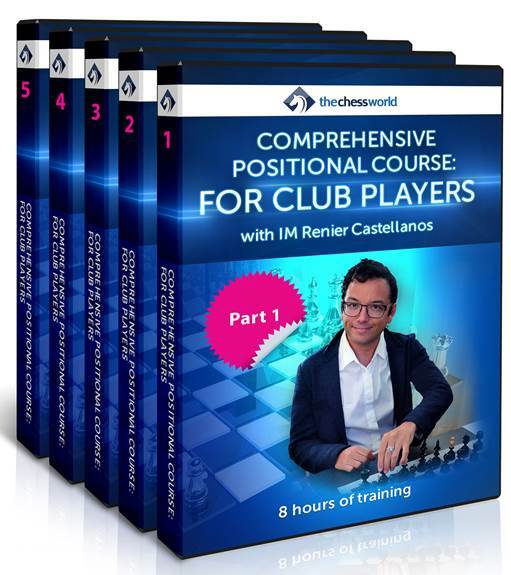 It is a highly structured training covering 15 most important positional elements that every chess player must know. You won’t wake up a positional expert overnight, but thanks to IM Castellanos’ decade of experience, you will get an unparalleled edge against your competition. is an active chess player and trainer for over 10 years, have worked for Chessbase and done live commentary on several major events, winner of many international tournaments. One Grandmaster norm. Highest FIDE rating 2529.